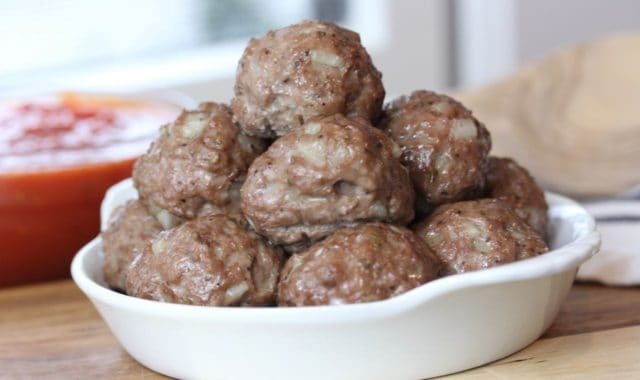 These grain free meatballs are one of the easiest meatballs you will ever make. I often make them on the weekend as part of my meal prep but they are simple enough to pull together on a busy weeknight as well. Try serving with your favorite tomato sauce over a bed of zucchini noodles or spaghetti squash for a tasty and nutritious dinner, any night of the week. Preheat oven to 350 F. Place a wire rack on top of a rimmed baking sheet. Combine all ingredients in a large bowl, and using your hands, mix until just combined. Grab about a tablespoon of the mixture and roll in your hands to form a ball. You should end up with about 18 meatballs. Place the baking rack into the oven and bake for 20 minutes or until cooked through. Enjoy! 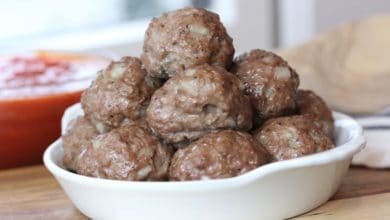 These meatballs are perfect for meal prep. Bake them on the weekend and then cool and transfer to an airtight container. They will last in your fridge for up to 5 days. Can I make this with ground turkey ?